In fact he’s been pretty damn robotic. He seems to have forgotten how to be a person. Like in the Season 8 premiere, when Jon and Dany were talking to Sansa after arriving at Winterfell, and Bran interrupted their conversation to start screaming about the Night King. 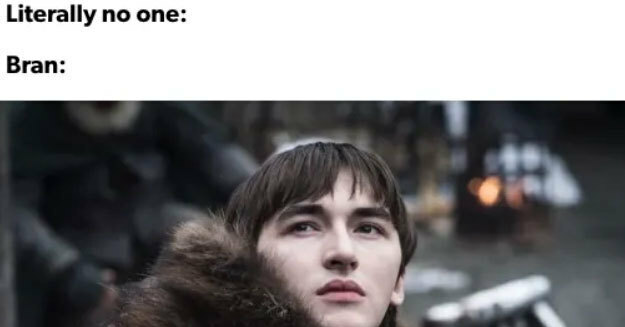 Or when he then just sat around for the whole episode staring at people – secretly waiting for Jaime Lannister (you know, the guy who pushed him out of a window in Season 1) to show up. And then when Jaime did show up, Bran just…stared at him?? ?